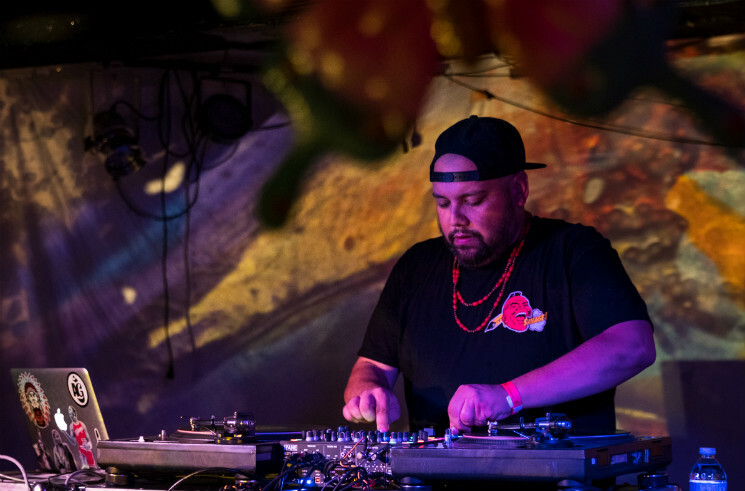 DJ Shub has wasted no time building a name of his own since his sudden departure from the celebrated A Tribe Called Red, doubling down on the tested powwow-step — contemporary Indigenous music wherein traditional powwow drums and singing met a spectrum of EDM genres — that grew out of their Electric Pow Wow nights in Ottawa, pushing it to include new wrinkles on a 2016 EP named after it. Signalling his Camp Wavelength arrival with the mighty resilience of first single "Indomitable," the Fort Erie-based Mohawk DJ proceeded to give a master class in powwow-step production that went late into the night, juggling a pair of decks and liberally stirring influences into the fray with scratch fury. He built some jungle-touched reggae into the set, and at one point chopped a sample from Protoje's "Who Knows" into a hungry bass journey amongst EP tracks like "Smoke Dance One" and "Come on Over." The night bore some fresh, fully formed fruits, too, including a hype-bearing unreleased collaboration with Winnipeg-based Anishinaabe hip-hop producer Boogie the Beat and another track that floated resistant hip-hop calling for the repeal of Bill C-51 over soca rhythms. Cadence Weapon and DJ Shub Team Up for New Song "Superhero"